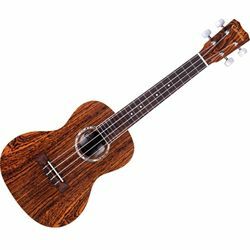 The 15CB is a hand made concert ukulele built with exotic bocote woods that offer a well rounded and rich tone that is as delightful as its distinct appearance. Stunning appointments like the 15CB's abalone rosette and cream binding set this ukulele apart from other models in this modest price range. Additional features include a subtle satin finish, silver tuners with pearl buttons, and premium Italian Aquila strings. Beginners and professionals alike will appreciate the 15CB's good looks and easy playability.